An easy side dish with a burst of spring and summer flavors that can be made year around! This is a perfect picnic alternative to potato salad. Your guests can pick them up and eat as is or cut into pieces for more of a salad take. Fresh dill is essential as is the lemon infused olive oil. A regular lemon will not have the same taste, but will work in a pinch combined with regular olive oil. Give it a quick drizzle of the lemon infused olive oil before serving for that little something special that is only yours! Lemon Infused Extra Virgin Olive Oil can be purchased on-line at Spicewood Food Company. 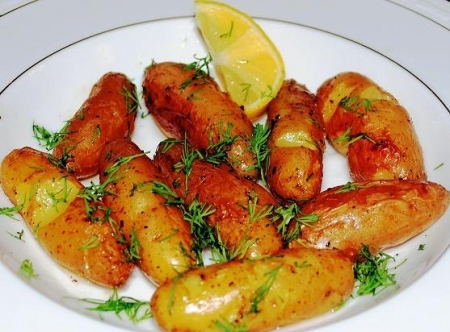 Clean and dry potatoes. In a large baking dish combine all ingredients, except for dill. Stir until all potatoes are coated with oil and a light sprinkling of kosher salt and fresh cracked pepper. Cover. Place in a preheated oven at 375 degrees for about 45 minutes. Once they are fork tender, they are ready to serve. Serve warm or chilled. When ready to serve, regardless – warm or chilled – mix in fresh dill to evenly coat the potatoes and give a little drizzle of the lemon infused olive oil.